Craft Floor As craft distilling and craft brewing become increasingly localized, producers are likewise looking for local materials - grain, hops, fruit, spices and other ingredients. Floor malting offers the small brewer or distiller an opportunity to source barley from farmers in their area and turn it into malt, the backbone of beer and malt whiskey. While floor malting was largely supplanted by industrial-scale drum malting in the 20th century, the older methods offer a handson opportunity to produce unique malt with less equipment. Craft Floor Malting: A Practical Guide offers an examination of the key stages of the floor-malting process, and a look at how craft floor maltsters approach the day-to-day necessities of malting at a small scale. If you’re considering starting a distillery begin here. 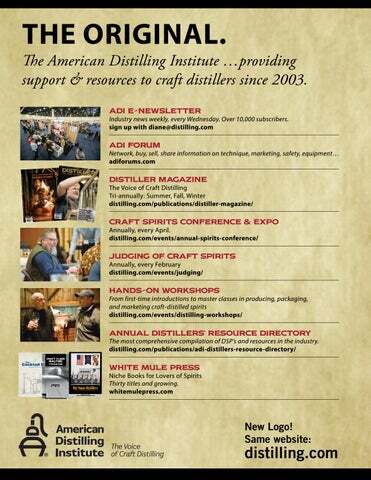 The information here is invaluable and reads much like a series of mini-workshops on distilling and the business of distilling. This book is compiled by the American Distilling Institute, an organization dedicated to the growth of craft spirits. The Nano Distillery is a compilation of how-to chapters and real-life experiences of distillers who successfully produce quality spirits on a small scale. Complete with formulas, spreadsheets, and firstperson accounts The Nano Distillery is intended to provide you with enough information to roll up your sleeves and get distilling. Chapters include the necessary considerations of operating a distillery and making spirits—legalities, equipment, record-keeping, recipes, trademarking and design. And finally, you’ll hear the voices of nano distillers themselves, who explain what’s worked for them and what hasn’t.